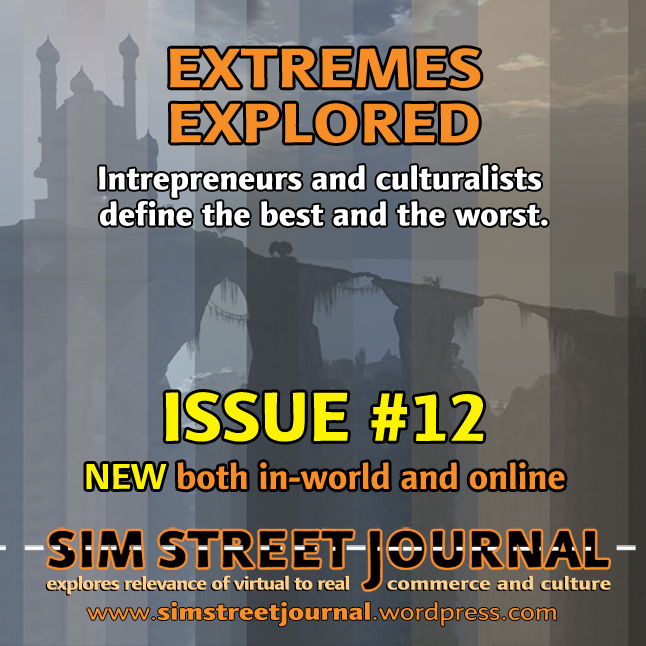 Sword and I were recently interviewed in-world by the Editor and creator of Sim Street Journal, Eleanor Medier, in respect of being virtual club owners, and all that entails. It was a fun interview and Eleanor asked some very interesting and thought-provoking questions. It made us really have to consider some of the reasons we do what we do. As the quote from the magazine below states, there is the online version, with a link to the front page here, or you can pick up an in-world version from various vendors (we have one at the bistro if you want to come and grab one). The magazine is Published in complimentary versions: in-world and online. This entry was posted in Uncategorized and tagged interview, sim street journal.